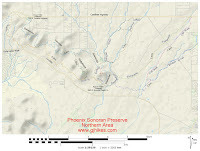 The Badger Brawl trail is located in the northern area of the Sonoran Preserve in Phoenix, Arizona. 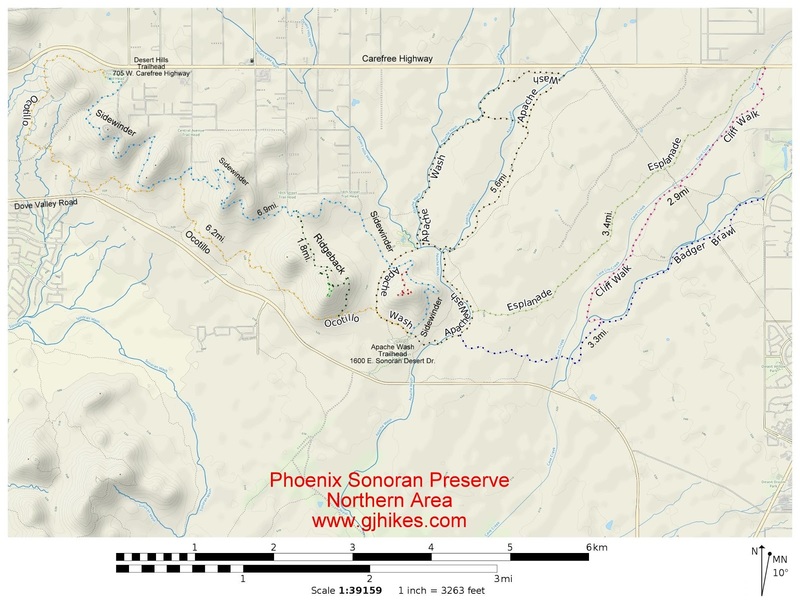 The trail begins off of the Apache Wash Loop about a half mile from the Apache Wash trailhead where it travels for 3.3 miles all the way to the eastern boundary of the Sonoran Preserve. Enroute it is connected to by the Cliff Walk trail as well as several short routes that connect to the Cliff Walk and the East Skip Rimsza Paseo trails. The Apache Wash trailhead is at 1600 East Sonoran Desert Drive. This post begins at the end of the Badger Brawl trail at the eastern boundary of the Sonoran Preserve near North 40th Street. There isn't a trailhead at this end of the trail. Just the subdivisions along North 40th Street. We got to this point after riding Esplanade and Cliff Walk. The trail starts out across a very flat and very easy hard packed surface. Before the trail has gone a quarter mile it comes to a connector that leads over to the Cliff Walk trail that is just over a half mile away at this point. There are a couple of shallow washes to buzz through just before passing beneath some high voltage powerlines after which the trail continues as before. At the 1.8 mile point from the end of the trail Badger Brawl is connected to by the Cliff Walk trail. Around the 2.2 mile point the first of 2 connectors comes up that runs over to the East Skip Rimsza Paseo trail. The next connector is a little less than another quarter mile. The trail transitions from smooth and flat to something a little bumpier as it crosses the wash of Cave Creek and works its way up to the more level ground on the other side. The last part of the trail flattens out once again as it rolls to an end at its junction with the Apache Wash Loop. From here it is right at a half mile to the Apache Wash trailhead. The Badger Brawl trail get a lot of use from hikers, trail runners and mountain bikers. Many of the mountain bikers combine it with the Esplanade and Cliff Walk trails to make a nice 9 mile loop if you include the extra distance to and from the Apache Wash trailhead. Without much in the way of hills to deal with it is a mostly easy 9 miles. As far as the Badger Brawl trail goes, if you would like to see it for yourself then all you have to do is grab your bike or 'Take a hike'.